Custom Grand Cabaret with Implant Pickup. We were lucky enough to meet Gene through a mutual friend, Dr. Frank Forte. Dr Frank, who is thoroughly immersed in the Jazz community played a Cabaret and convinced Gene to visit us when we still had our shop in Florida and are we glad he did. We've been friends ever since and we couldn't have a better representative of our Classical guitar than Gene. Gene is a phenomial player and human being and we couldn't be happier having him in our Buscarino family. Hear Gene’s Cabaret on his CD's “Body and Soul”, "Quiet Now" and "Concerti"
2 of the Models that bear his name (part of the Prodigy collection) one with the locktop design and one without both with 2 built-in humbuckers and a Starlight Nylon. Former Guitar editor of Mel Bay Publishing, Corey is known for his live performances and his clinics. Hear his Buscarino's on his 2 newest and critically acclaimed CD's "Lone Prairie" and "Factory Girl"
Ken's first Buscarino purchase was a Starlight Nylon he bought from Manny's in New York City. We then had the good fortune to meet Ken at a guitar show in New York, and instantly knew we needed him as an endorser. His first Cabaret had the Implant Pickup which you can hear on his C.D, "Music for Guitar and Bass". The Next Cabaret had the RMC Pickup and built-in E.Q. which you can hear on his CD's "Dyad", "Phoenix Rising", "The Surrealist Table" and "String Theory" Ken also has a Cabaret Double Top with RMC Pickup which you can hear on his CD's"Etudes for Solo guitar in 24 Keys", "For Langston", and "To Be Continued: Ken Hatfield and Friends Play the Music of Bill Mccormick". Ken has 10 CD's as a leader and I really couldn't tell you which is my favorite. They are all amazing, check them out for yourself! 17" Monarch with European Spruce top and Floating Humbucker. Ron was one of our first endorsers of the Archtop back in the early 90's and boy did we get lucky. With his fiery passion for music and his unbelievable chops he shows off the Monarch to Perfection. You can hear Ron's Monarch on his CD's "Ringside" and "Solotude"
16" Artisan and Concerto Double Top Carved Back Classical. Guitarist, Composer and Recording Artist. Internationally acclaimed guitarist Ted Shumate has performed and/or recorded with some of the most famous musicians in the history of jazz and blues, such as: Nat Adderley for 10 years, Ira Sullivan, Red Rodney, Jimmy Cobb, Kenny Drew Jr., Joey Barron, Peter Erskine, Branford Marsalis, Lucky Peterson, Sonny Fortune, Larry Willis, Al DiMeola, Jeff Berlin, Walter Booker, Chip McNeill, Kenny Werner, Garry Dial, Gumbi Ortiz, Longineu Parsons, Wynton Marsalis, Gonzalo Mico and many others. Ted has been a guitar professor at Northwest Florida State College, and at Gulf Coast State College where was also the director of the jazz band and taught jazz improvisation courses. Shumate also taught at the prestigious Guitar Institute Of Technoloy at Musicians Institute in Hollywood, California. Cabaret with an Implant Pickup. Mike was a professor and Director of Guitar Studies at Utah State University. You can hear his Cabaret on his solo CD "Walkin' My Baby Back Home" or on his Lightwood Duo CD "No More Blues" with Clarinetist Eric Nelson. Fun Fact: Mike is Corey Christiansen's dad and his daughter Emily and her husband Brent Wheeler also Play Buscarino Guitars. gives new meaning to the adage "the family that plays together, stays together"
16" Virtuoso, 16" Prodigy, 16" 22 Fret Nylon, and a Rhapsody Carved Back Flat Top. Bob depends on his Buscarino's as a critical component of his music. Bob Composes, performs and records all-original jazz compilations. 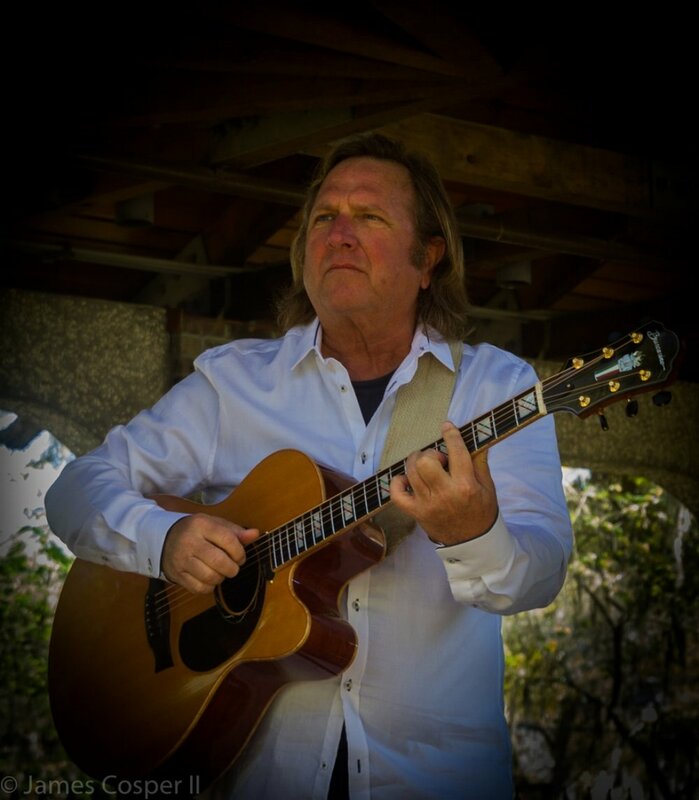 Check out Bob's guitars on his CD's "First and Monroe" and "Lets Get Together". A really talented and inventive player who we are proud to have playing our guitars. Cabaret and Starlight Nylon in his Signature Blue Color. Steve Contacted me over 25 years ago when he was in need of a nylon string guitar. At the time I was only making my small bodied Starlight Nylon Electric Acoustic and was honored to build a guitar for such a talented and amazing guitarist. When I came out with the Cabaret a few years later I asked Steve if he would like me to build him one and he said "yes, on one condition. It has to be my signature "blue" and so it was. Steve is considered one of the hardest working guitarists in the world and is widely known for his stylistically diverse compositional skills. He was voted Best Overall Guitarist by Guitar Player Magazine five years in a row from 1982-1986 qualifying him for their "Guitar Player Hall of Fame"
We were fortunate enough to meet Rory Hoffman at The Chet Show in Nashville, TN a few years ago. We had a booth set up and Rory walked into the room and was checking out everyone's guitars so I got my courage up and placed one of mine in his hands. It was a magic moment for me and one I will never forget. Rory plays the guitar with it sitting on his lap with the bass strings facing away from him. The music that came out of my guitar was like nothing I had ever heard before, the Django worthy speed runs and piano style chords were just awe inspiring. I knew right then and there I had to get Rory on my team; thankfully he agreed. We built him a gorgeous Virtuoso with an Oval Sound Hole which you just might be able to see him play if you are ever in Nashville. Rory started teaching himself to play multiple instruments at just 3 years old and we are just grateful that one of them was guitar! 17" Virtuoso, 2 Starlights (1 nylon and one steel) and a Mira Solid Body. Listing MIke right after Steve Morse here on our Artists Pages is no coincidence. Mike saw Steve with his Starlight and inquired where he could get one. We got a call and we built him 2 Starlights, one Nylon and one Steel. Later on when he was in need of an Archtop we got another call and made Mike his Virtuoso which you can hear on his CD" World Goes Round" Mike has played with all the greats including Chick Corea, Natalie Cole and Bette Midler. Joe is one of our first and longest endorsers and has been playing our guitars for over 30 years. Joe plays all of our classical models including The Cabaret, The Concerto, The Starlight Nylon and the Starlight Requinto of which we only made one. Joe is an educator at St. Pete College and Eckerd College and is a professional musician and private teacher in the St. Pete area of Florida. He has over 40 years experience in various styles of music and was trained in Italy for Classical Guitar. Joe is a well respected musician and teacher and we are grateful to have him as an endorser. Mira Solid Body and a 7-String Starlight Archtop. As well as a touring musician and composer Mark is also a senior Professor of Guitar at the Berklee College of Music. He holds a Bachelors and Masters degree in Music from the New England conservatory and has studied with Joe Negri, Joe Pass, Jack Wilkins, Gene Bertoncini and Charlie Banacos. Mark has worked as a performing Jazz Guitarist the past 30+ years and has published 4 books. Mark is a welcome addition to our players family. Mike, long time Buscarino Endorser and friend has multiple guitars including The Jazzman 7-string electric archtop which is his main axe. He also has a Jazzcaster 7-string solid body, a Blue Artisan Archtop and a 17" Monarch. 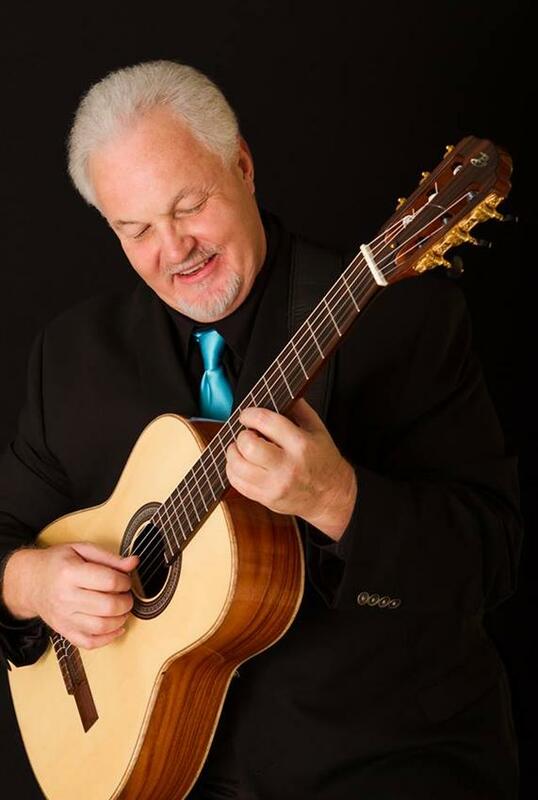 Mike can be seen and heard in the San Diego area in California playing local gigs and is considered one of the premier Jazz Guitarists in the area. A former San Diego Sheriff's Dept. Lieutenant Mike is now retired from police work and plays music full time. Fun Fact: Mike founded the "Buscarino West Coast Appreciation Society" where many of our players and Buscarino Guitar owners get together once a year and celebrate music and their Buscarino Guitars. 2 Prodigies and a Rhapsody carved back flat top. Gideon King is a New York City Guitarist and Composer and you can hear his guitars on his CD City Blog. "My Rhapsody is incredible warm and precise and I consider this guitar a friend: John also built me 2 Prodigy axes, one is more jazz oriented and the other allows for more distortion and gain. These are incredible guitars the amazing tone of which reviewers have noted"
Nate owns 4 Buscarino's, a Cabaret, Gigmaster, Mira Solid Body and a Starlight Nylon. A St. Petersburg, Fl based guitarist and composer Nate's major musical influences include Django Reinhardt, Wes Montgomery and Charlie Byrd. Charlie Byrd's wife Becky said "there is no doubt that there is a piece of Charlie's soul in Nate's mind, heart and fingers" and that is the beauty of Nate's musical power. He takes that inspiration and makes it his own to create truly magnificent and inspired music. 17" Artisan. Jeff is instructor of Jazz Guitar at Bellarmine University in Louisville, KY and is the founder and host of the Annual Bellarmine Jazz Clinic. Hear Jeff's Artisan on his CD "Some Other Time" on the songs Impromptu #1, Always and Forever and Heat Wave. Steve Cosper bought his first Buscarino in 2014, he was looking for an archtop but he gravitated towards the Rhapsody Italia we had for sale and just fell in love. He was intrigued with the idea of a carved back on a flat top as well as the combo of the Magnetic and Acoustic Pickup. He was so taken that he bought it on the spot. As luck would have it 3 years later Steve was back in the shop for some maintenance on his Rhapsody and we had an Available Artisan Archtop (are you noticing a theme here?). He was not in the market for a new guitar but he picked up the Artisan and just couldn't seem to put it down. about a week later He called and said he just had to have it. We are proud to have Steve as part of the Buscarino Family. He has been playing and teaching guitar for over 50 years . Steve attended The Southwest Conservatory in San Antonio where he studied under Jackie King and Dave Hill. In 1985 He joined the U.S. Army premier jazz orchestra "The Jazz Ambassadors which is the most traveled musical organization of the U.S. military. Now Retired Steve devotes his time to his grand kids, fishing and of course playing guitar as a first call freelance musician in Panama City Florida.